Rep. Pat McElraft and Sen. 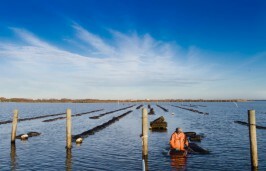 Norm Sanderson told attendees at the annual Oyster Summit in Raleigh they plan to introduce legislation that addresses conflicts related to the state’s shellfish leasing program. Legislators included new ways to raise cash for coastal towns’ storm-related expenses and infrastructure needs, such as local-option sales taxes, in a spate of bills filed in recent days. In the wake of Hurricane Florence, the North Carolina General Assembly has given more attention to climate change, though some legislators remain skeptical. 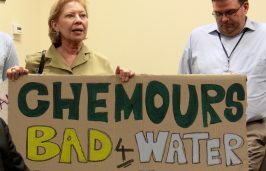 The state Senate Thursday advanced a bill that would eliminate the oversight boards for the Clean Water Management Trust Fund, the Parks and Recreation Trust Fund and four other boards. State lawmakers are expected to consider another storm-relief spending package, including infrastructure and agriculture assistance, when they convene again after Thanksgiving. State legislators approved Senate Bill 3 in a unanimous vote, but environmental advocates and some lawmakers say the measure falls far short of what’s needed. 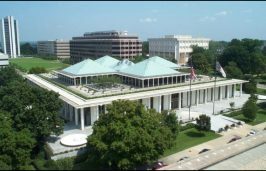 Five former N.C. governors urged voters to reject the constitutional amendments the legislature has approved for the ballot in November’s election, as the Southern Environmental Law Center and the NAACP launch a court challenge. One of the General Assembly’s six proposed constitutional amendments on the ballot this fall would significantly shift toward the legislature the state’s longstanding balance of power in environmental regulation.